Sweet 301...is a fabulous, upscale, casual yet elegant 3 bedroom, including kids' bunk room condominium. It is located on the top floor of Grand Isle, direclty on 30-A, in the heart of Seagrove. Situated along the serene northern Gulf Coast of Florida, Seagrove Beach is the ideal spot for families with children who just want to relax. The perks of a beachfront town and the surrounding coastal ecology put Seagrove Beach rentals in the middle of the perfect destination to wind down and forget about the hectic life of the city. Seagrove Beach vacation rentals offer the comfort and convenience that families look for in a vacation to get away from it all. Seagrove Beach is the place to go for quiet time. The beaches are wide open and the warm and peaceful Gulf of Mexico sets the perfect backdrop for your stay. A secluded destination along Florida's Emerald Coast, the town is bordered by beaches with pure white sand, dune lakes, and pine forests. It is built along a scenic road, so you and the kids can marvel at the beautiful surroundings no matter where you go. 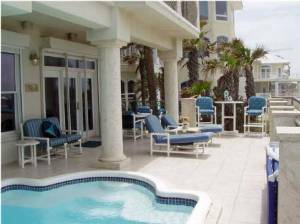 Seagrove Beach vacation rentals by owner offer lovely accommodations among quaint surroundings, so everyone can have as much quiet time as they want. Even feel refreshed as soon as you wake up in the morning; take it slow, read a newspaper, and plan an outdoor excursion at your leisure. Peruse the shops and dine at the restaurants in town only when you feel like being around people. The best thing about Seagrove Beach is that you can be isolated and take in all that nature has to offer. A spectacular experience can be had by the entire family as the down time and peacefulness brings everyone together. Far different from a motel or hotel vacation, Seagrove Beach condo rentals offer full amenities, There is even a full kitchen so you can make a snack or dinner in the open confines of your home away from home. The space at Seagrove Beach rentals is enough for the adults and kids to spread out into different rooms and enjoy their privacy. With the many options and extra amenities, Seagrove Beach rentals may be more affordable when you consider what you get compared to a hotel or motel room. This is a big plus for anyone looking for rest and seclusion, and the tourist crowds will be far from sight. Seagrove Beach is far removed from Florida's busy tourist attractions. It is a place to seek peace of mind and relaxation. If you want to take a scenic drive, scenic road 30-A will take the family 18 miles along the beautiful Gulf coast and the peaceful communities along the way. Start planning your time at Seagrove Beach vacation rentals by owner today and take advantage of amenities that make this a much different vacation experience than a hotel or motel stay. Options from luxury to much needed family comfort make for a vacation experience that will be unforgettable. Enjoy a domestic secluded getaway that is far from the crowds and major tourist attractions when the family chooses Seagrove Beach rentals. Interested in More Seagrove Beach, Florida? Check out nearby Destin , Dune Allen Beach , Lake Powell , Miramar Beach , Panama City Beach , Sandestin , Santa Rosa Beach , Seacrest , Seacrest Beach , Seaside .